Similar to scales gauging hurricane, wind, or tornado intensity, could aid flood response and water management, especially in the West. Click here for official Scripps Insitution of Oceanography news release. 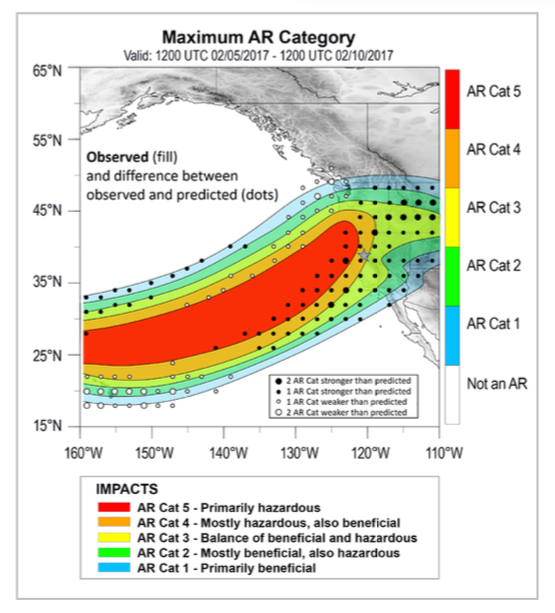 Top: AR CAT conditions associated with one of the largest atmospheric rivers in February 2017, a record breaking wet year. Bottom: AR CAT scale and typical associated impacts. Atmospheric rivers are the source of most of the West Coast’s heaviest rains and floods, and are a main contributor to water supply. For example, roughly, 80 percent of levee breaches in California’s Central Valley are associated with landfalling atmospheric rivers.